So Y’see, it does make some sort of sense… Um, doesn’t it?? To paraphrase Pogo; she has met the enemy and they is her! Um, well – kind’a, sort’a, maybe… is that definitive enough for you? 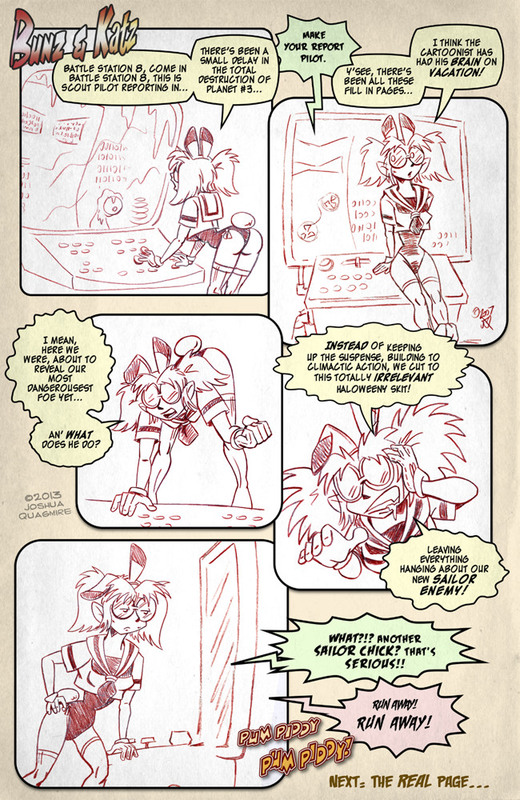 You might say that she’s a ersatz Sailor Bunny anyway… I’m just guessing you understand, as I wasn’t there – But I ‘spose the general idea was: the A.I.s wanted their emissary to resemble the most fearsome of Earth’s defenders – they didn’t actually want to fight one! Ah! So desu! Actually I am indulging an internet vice called “annoy the creative and talented guy who does all the hard work and lays it out here for me to enjoy and kibitz on for free.” I promise to assume the front leaning rest position and do push-ups until I die to atone. Ah so, is not true… many peoples are reading this page, but are being stunned into silence by its transcendent loveliness and profound philosophical truths. Is so! I like computer consoles that are designed for FLBP users. Or designed to Watch Future Lower Back Pain users uh, Use them. What was my point again?